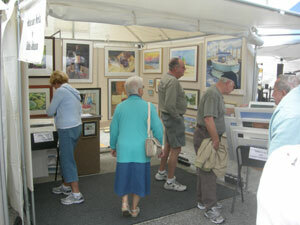 My husband, Ken, and I participated in the Indiatlantic Art Festival this past weekend. Saturday was chilly and Sunday was windy, but we had a wonderful time! 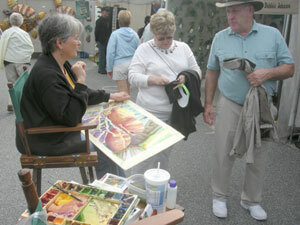 We talked with lots of people about watercolor painting, upcoming classes and I worked on two paintings during the show. Here you can see the Coconuts painting I was working on during the show on Saturday and early Sunday morning. Below are just a few guests looking at the artwork I had on display in the booth. New classes are starting up in February, and I have a Beginner's Watercolor Workshop on Saturday January 30th. Please visit my website for more details and registration options.